My First Book of Vietnamese Words: An ABC Rhyming Book of Language and Culture. Tuttle Publishing, 2017. Sky Blue Water: Great Stories For Young Readers. University of Minnesota Press, 2016. by Jay D. Peterson (Editor), Collette A. Morgan (Editor). An anthology of 20 Minnesota authors. Vietnamese Children’s Favorite Stories. Illustrated by Nguyen Thi Hop and Nguyen Dong, Tuttle Publishing, 2015. Phuoc Thi Minh Tran is the first Vietnamese librarian in Minnesota. 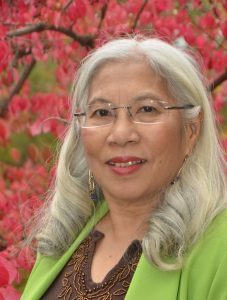 A boat people, a respected storyteller, a 2016 Minnesota State Fair Blue Ribbon author, and a published and award winning author, she has shared her experiences and knowledge of Vietnamese culture, the richness and beauty of Vietnamese folktales, and her refugee experiences at various cultural events, storytelling programs, conferences, libraries, universities, colleges, and schools throughout the state and beyond. Phuoc Thi Minh Tran was recognized for her work bridging cultures and introducing the culture of Vietnam to the mainstream community. Winner of the 2015 Moonbeam Children’s Book Awards Gold Medal. All About Viet Nam is an educational program developed for students, which takes students on a make-believe trip to Viet Nam. The program uses music, storytelling, history, artifacts, art & crafts, and traditional games to make the adventure come alive. This program is designed to introduce students to key holidays in Viet Nam through hands-on, interdisciplinary learning. These fun activities explore geography, language arts, and history. Students will be captivated as they learn about Viet Nam history, culture, and cuisine and make connections to their own lives. Learn the process of writing, author and illustrators relationship, publishing, and marketing as well as see some of the illustrators’ initial sketches and final with published author Tran Thi Minh Phuoc. Her first book, Vietnamese Children’s Favorite Stories (Tuttle Publishing), won the 2015-2016 Anne Izard Storytellers’ Choice Award, the Creative Child Magazine 2015 Book of the Year Award and Moonbeam Children’s Book Awards 2015 Gold Medal. Would you like to know why ducks sleep on one leg or hear the story of Phu Dong village who defeated the Northern invaders with his iron horse? Please come enjoy a special program of Vietnamese folktales. Storyteller/librarian/author Phuoc Thi Minh Tran will bring alive for listeners of all ages her favorite and delightful stories and legends. You’ll even learn about Da Trang who can hear the animal voices! Best for all ages. Please contact the author for the availability and rate.